When my child was too young for school but old enough to walk, we went out in the backyard one morning where our grass was dotted with clusters of white bubbles glistening in the sun. Each tiny, individual bubble was marked with rainbows. It was a fairy garden. I showed her how a person could take two fingers and reach into the bubbles to find the small, green, triangle-shaped insect that lived inside. Spit bugs, in the nymph phase. Some people call them spittlebugs, or froghoppers. They call the white foam “cuckoo spit.” The creatures are adorable, nature's easiest little pets, and my daughter reached for one with her cherubic hand. It was a mother-daughter moment in the natural world. Later, on our walk to the library, she said, “Oh, mama, look!” and reached her innocent baby hand out again, as I'd taught her, now toward long grass that grew alongside a busy road, grass full of broken bottles and one-hit pot smoke stubs, and I saw her fingers move toward not the white, frothy home of nature's adorable pets but instead the thick phlegm of a new loogie on a city sidewalk, and I screamed and pulled her back so fast she lost her tiny hand-knit stocking cap. I spent a long time that night surfing real estate listings for houses in the country, places to raise our girl closer to paradise. Our 1920s Craftsman, decent but in disrepair, is in Portland, near a drug rehab center and more than one drug dealer, in a neighborhood crowded with churches. There's always somebody struggling, coughing and hacking, looking for salvation. There's still land in the country, if a person has the money, and there are houses in small towns. I found affordable shacks, ranch homes, and options that would only involve praying an old well was still good, or maybe building a new house where a quaint old cabin/meth lab had been demolished. Also, any change would mean adopting a new morning commute, for both my husband and me. Where we live, I can coast on my bike less than two miles to work. I tried to envision a daily drive from the country, imagined it as we toddled to the library and parks, drove to ballet, crossed paths with friends, or took the bus to the museum. I thought about it at the planetarium. If we lived in the country we'd see more real stars, but we'd have to drive to reach this narrated projection. And while I was turning over options, our daughter learned the urban ways—not to pick up anything on the street, not to touch a stranger's spit. She learned to imitate the dance of a man we saw high on who-knows-what, who couldn't decide if he should open a gate in a cyclone fence or not. He kept turning, reaching, turning away, then turning back, and my daughter watched and did the same, like the hokey-pokey. I said, “Don't ever do street drugs, sweets,” and hoped the city might serve as a cautionary tale. Sometimes we hear the saxophone player practicing in his apartment at one end of our block. His ex-wife lives a few houses down, on the other side of us. I've known her for decades, since we worked as temps together. Their kids run easily from one house to the other, an amiable divorce. Between our home and the saxophone player's apartment, there's a veterinarian and a pediatric ER nurse. When our dog had a tick near his eye, I hoisted him over the fence for an impromptu exam and removal. A rock star/DJ lives across the street with her daughter. She's big in Europe, tours in the fall, throws parties twice a year, and posts photos on Facebook of things like riding a camel in the Israeli desert. Our kids play Littlest Pet Shop together. Other houses are owned by booksellers, writers, entrepreneurs, and people with jobs I'm not at liberty to discuss. We have an unofficial “mayor” on the block, by which I mean a man who's always home, who knows the local history and what's going on. He's the eyes and ears. Sometimes he's a mediator. It's possible he's a corrupt mayor, definitely a little debauched, but he's okay. When our daughter started kindergarten, I looked for the public school option with the best air quality. If she was going to spend six hours a day in a building, I wanted it to be radon- and asbestos-free. Also, I hoped for a structure whose brick and mortar had a chance of withstanding an earthquake. It seemed a minimal expectation. The St. Helens highway, on the way to Scappoose, is lined with the large white drums of industry that blow benzene and other contaminants. We'd have to go farther, maybe into Eastern Oregon or south of Coos Bay, where jobs are harder to come by, farther away from humans. The best way to improve our air would be to leave the city, go out and stay out. Our daughter's now in elementary school. She's growing up here, breathing this air, knowing city people. The city has changed around us, our neighborhood filling in with microbreweries, coffee roasters, and bike lanes. It's been featured in the New York Times and Sunset magazine. An elderly couple just passed their house on to real estate “flippers,” investors who immediately knocked the house down and are starting to build two sleek, skinny, attached houses, the urban in-fill way. But our unofficial mayor still works on cars in the street, the bottle collectors still shuffle by, and we still walk to the store and our local library. On our rugged stretch of city blocks, the Fourth of July lasts from late June until mid-August. There's always somebody annoyed by the fireworks and somebody else lighting fireworks off, in houses side by side. The roles change: whoever wants to sleep or has to go to work is annoyed; whoever holds the lighters and a bottle of beer has a good time. When I lived only a few streets away, a decade earlier, nobody could afford fireworks. Instead, neighbors shot rounds into the sky. Personally, I think actual fireworks, instead of gunshots, are a fine upgrade. Once in a while, somebody might call the police. Plenty of the fireworks are illegal, and then there are noise laws, but fireworks are small potatoes in the world of urban crime. If the police show up at all, they roll by slowly and give a nod. There are days I pass the time standing on the sidewalk, with the neighbors, kicking around ideas about moving away. We'll talk about property we've seen—land along the river south of town with room to kayak, or huge spreads up in Richfield and Mossy Rock, Washington. I have my eye on a compound for sale, on the market right now. It's a walled-in wilderness with a swimming pool and a sprawling mansion. If I had the necessary millions, I'd buy it and move as many friends as I could into that house with me. I'd build my own city, only with no industry and no pollutants. We'd have spit bugs and books and somebody to teach the children dance and violin. There was a time, years ago, when everyone I knew talked about moving to LA, New York, or San Francisco. Some people actually left. My friends and I stayed in Portland, downtown, long enough for almost everyone to come back home again. Now it's a familiar kind of musing to me, when we all think out loud about moving to greener pastures. And those people who spent time in LA or New York? The people who have moved back, they think Portland is the country, on a relative scale. It's turned into a land of urban chicken coops, backyard beehives, and gorgeous parking strips fostered by Friends of Trees. I'm a fan of our Fourth of July, even when it lasts a month and a half. 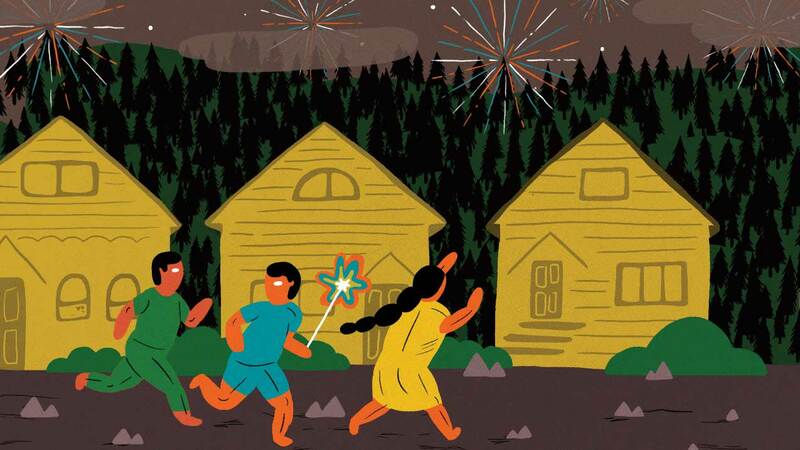 The night of the Fourth is when the kids run around late, in a pack, the way I did all summer when I was their age. There's beer and fireworks, the white, sulfurous smoke blending with that of a few neighbors' cigarettes. In a city, annoyances and pleasure blend and bleed together. I like having people around, with their faults and noise and humanity. When we're celebrating Independence Day, as families and generations, with our mayor, our rock star, and those whose jobs go unmentioned, with the writers and the drunks, all of us drifting through our invisible toxic soup, as we raise our kids, what we're really celebrating is the fragile, rewarding, and necessary emotional dependence that permeates and defines life in a city, with our mortality and our little cuckoo-spit houses side by side, our lives built on and enriched by the presence of other people. Monica Drake is the author of Clown Girl (Hawthorne Books),which was optioned for film by Kristen Wiig. Her next novel, The Stud Book, is forthcoming from Hogarth Press in February 2013.